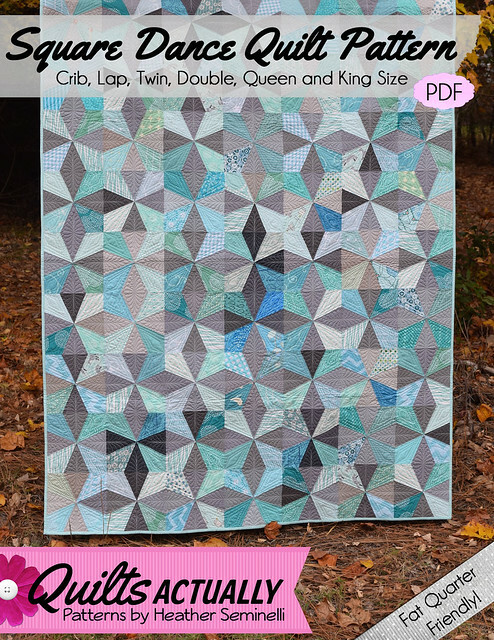 Paper pieced pattern includes photographic instructions and offers three block sizes and six quilt sizes for maximum value! I have been working on this quilt pattern for over a year, and I’m really excited to be able to share it with you today! 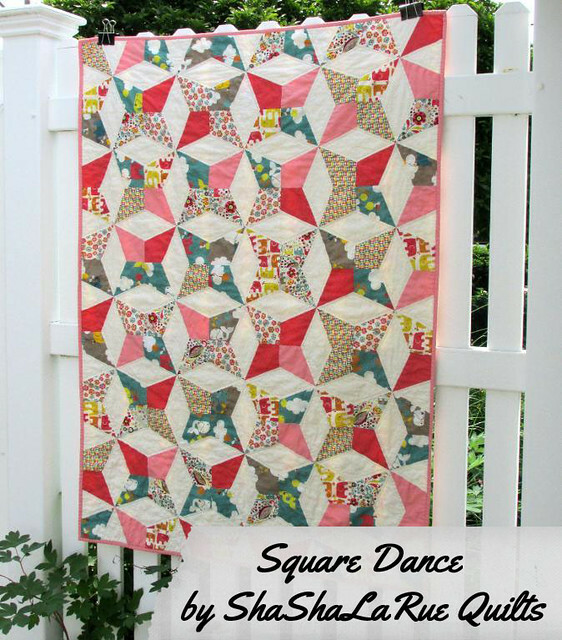 The Square Dance Quilt Pattern is now available in my Craftsy store. 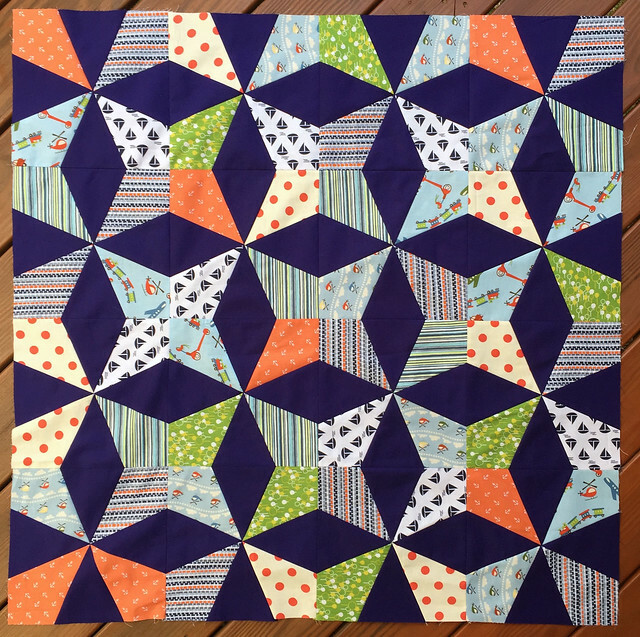 This is a paper pieced version of a traditional block – one of the traditional names for this block is Square Dance, and I thought it was the most appropriate name for the quilt once you see the overall movement created by the blocks. I experimented with many different sizes of blocks, and the result of that work is that this pattern includes 6″, 8″ and 10″ versions. I also tried a 4″ version, but it’s not practical for a quilt of any size! 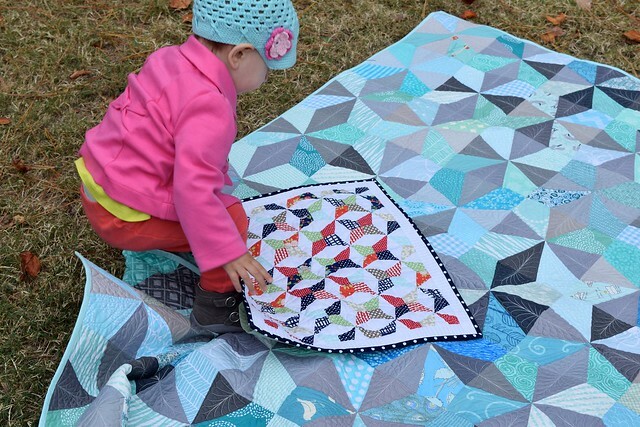 The instructions include fabric requirements to make 6 quilt sizes (Baby/Crib, Lap, Twin, Double, Queen, and King) from all three block sizes. This paper pieced block is a great introduction to paper piecing! I used this pattern to teach a group to paper piece and was very impressed by their results in a couple of short hours. A full color photo tutorial on how to paper piece is included with this pattern, so if you are new to paper piecing this is a great way to get started. 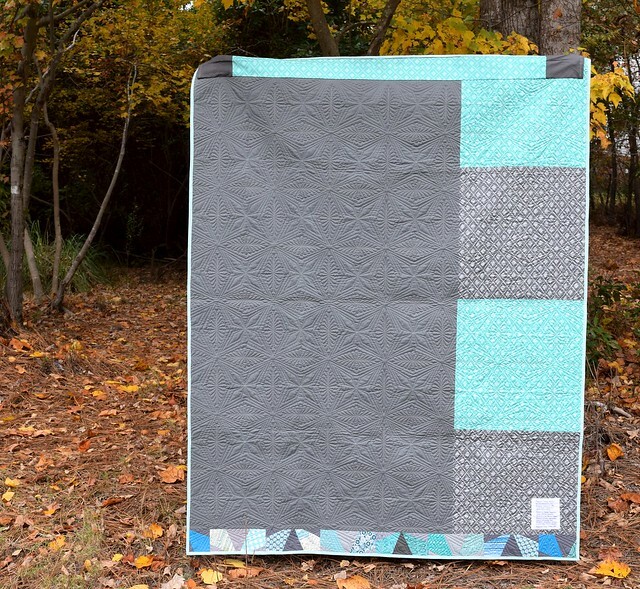 The cover quilt uses the 8″ version of the block. I had help making some of the blocks from my bee last year – the 2014 Stash Bee Hive 12. For this version, I custom quilted it and entered it in the North Carolina State Fair, where it earned 2nd place in the competitive Group category. Sharon of ShaShaLaRue Quilts also made a Frolic Square Dance Quilt. She can also be found on Facebook or on Instagram @ShaShaLaRueQuilts. Her playful version demonstrates the versatility of this block because this is perfect for a crib or baby’s playroom! The 6″ version is also great for Sampler Quilts or bee blocks because if you make 4 of them, it results in a 12.5″ unfinished block, which is what so many samplers or bees ask for! 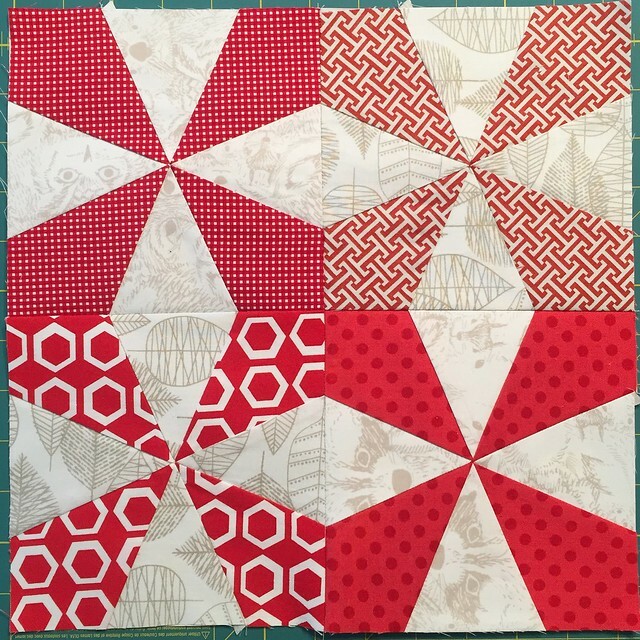 I made the block above to add to my “real world red & white” quilt. My guild, the Tarheel Quilter’s Guild in Fayetteville, NC makes quilts for the NICU. Our local hospital likes the quilts to be approximately 40″ square, so I used 16 of the 10″ blocks and made the little boy version of the quilt below. This quilt is made up of blocks made by my Quilting Circle – most of whom had never paper pieced before! In order to create variation like the cover quilt, a variety of fabric should be used. 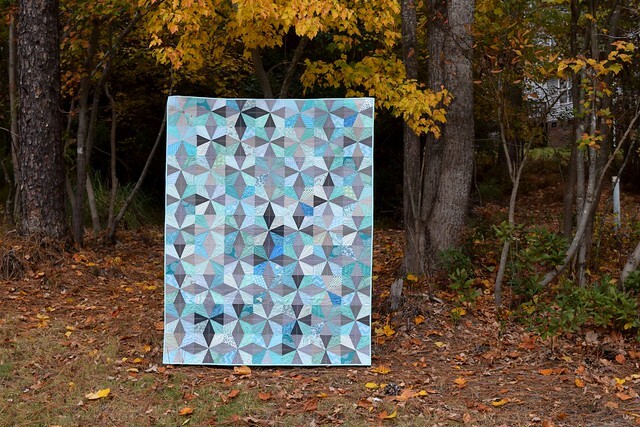 This quilt would also look amazing in just two colors, or invert the color scheme. Use any combination you can dream for your own look! You can make any of the block sizes or quilt sizes using fat quarters, half yards or full yards so this quilt is stash friendly! The pattern is available in my Craftsy store – Quilts Actually Patterns. It is on sale through Mother’s Day (May 10th, 2015) for $7.50. 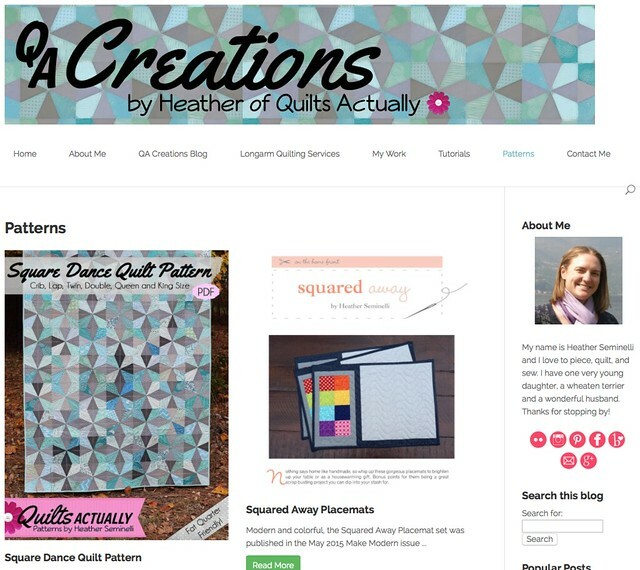 If you make this quilt, please share it with the hashtag #squaredancequilt or by tagging me @QACreations. You can also email me pictures or a link to your blog post at quilts actually(at)gmail.com. I would love to see what you make! Linking up to some of the following: Fabric Tuesday @ Quilt Story, Sew Cute Tuesday @ Blossom Heart Quilts, Scraptastic Tuesday @ She Can Quilt, Let’s Bee Social Wednesday @ SewFreshQuilts, Needle and Thread Thursday @ My Quilt Infatuation, Finish it up Friday @ Crazy Mom Quilts, Whoop Whoop Fridays @ Confessions of a Quilt Addict, TGIFF, Fabric Frenzy Friday @ Ft. Worth Fabric, and Show off Saturday at Sew Can She.